The toio system is a hands-on "toy platform" that lets users put blocks and other items on cubes and move the cubes around with a controller. The fun goes way beyond just getting the cubes to move around, though—the system is chock full of features that get children's creative juices flowing, starting with the ring-shaped controller. All in all, the new, eye-opening experiences of playing with toio sow the seeds of possibility in children's fertile minds. 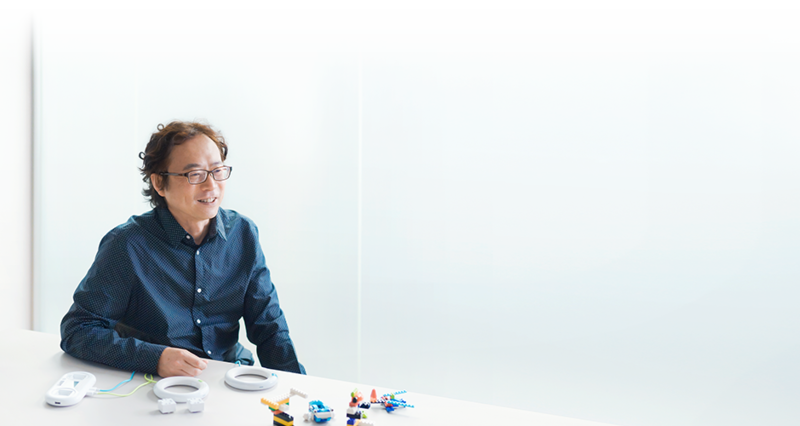 The idea for toio came from Sony engineers who wanted to give children something real to play with, not just another virtual diversion like a video game. As the product started to take shape, designers got on board and immediately set to reexamining the experience value at the heart of the system. Numerous meetings and discussions gradually gave the team a clearer idea of what we were after: an essential form of play that would bring children into a world of fun, inspiration, and growth through the creative process. With that basic concept in place, the designers came up with an idea for a ring-shaped controller. The project team had been envisioning a conventional, handheld controller that would echo standard gaming interfaces. The toio designers' approach, however, not only marked a stark departure from the traditional approach but also embodied a unique design message—focusing on both nurturing children's capacities for imaginative thinking and foregrounding the real-life, unimaginary play experience so vital to the toio concept. Why abandon the normal controller concept and go with a ring-shaped design? The design team wanted to avoid having adults decide exactly how children were supposed to use the controller. On a basic gaming controller, there's normally a directional pad (D-pad) that controls the target's movement—after all, most games involve players manipulating something up, down, left, or right on a two-dimensional screen. What the ring does, though, is provide full command of the target's actual movements without forcing the user to hold the controller in a specific way. The project team was quick to see the potential in the ring design, which helped ground the process of designing the interface in a more children-oriented point of view. By eliminating familiar constraints, the team had a fresh slate for designing the experience from a different perspective. If you could use the controller with one hand instead of having to use two, the designers figured, the controller would take on an even cooler identity. To make that possible, they installed a jog dial and placed the buttons symmetrically on both sides of the ring. Besides making the controller completely ambidextrous, the team's tweaks also give users the ability to use it with one hand, with two hands, or even flipped around. The designers also added a built-in acceleration sensor, which makes the controller an even more exhilarating, liberating part of the experience in itself—you can tilt the controller, swing it around, or even put it around your wrist, and it'll keep on moving the cubes. It's all about incorporating the controller into the imagination process: children discover ways to use it as they play, creating a more holistic, integrated creative experience. The project wasn't just about making the controller fun, of course. Another focal point for the design team was crafting the ring interface so that it would enable easy, straightforward play. To get the ring the optimal size, for example, the designers worked up a bunch of prototypes in different sizes, had children try them out, and zeroed in on the ideal size. They ended up giving the ring an egg-shaped cross-section, the configuration that's easiest for little hands to hold on to, and using tough, durable rubber materials for the inner circumference. One more key was bringing the actual fun to the fore by casting the "play" as the lead and the "product" in a supporting role. To accentuate the play component and minimize the visual presence of the components themselves, then, the team went with a white color scheme for everything—the console, cube, and controller—and kept the console as small as possible. With the physical pieces residing in the aesthetic background, the play takes center stage. I know that children are born with an incredible capacity for creativity. I want to help them take that gift as far as they can. For me, that vision comes from my own memories of when I was a child: playing in the great outdoors with my friends, getting our hands dirty, dreaming things up out of trees and sticks and rocks, and creating our own play. The ring is just a jumping-off point, I think—I'm excited about all the different controllers that today's children are going to be imagining into reality. 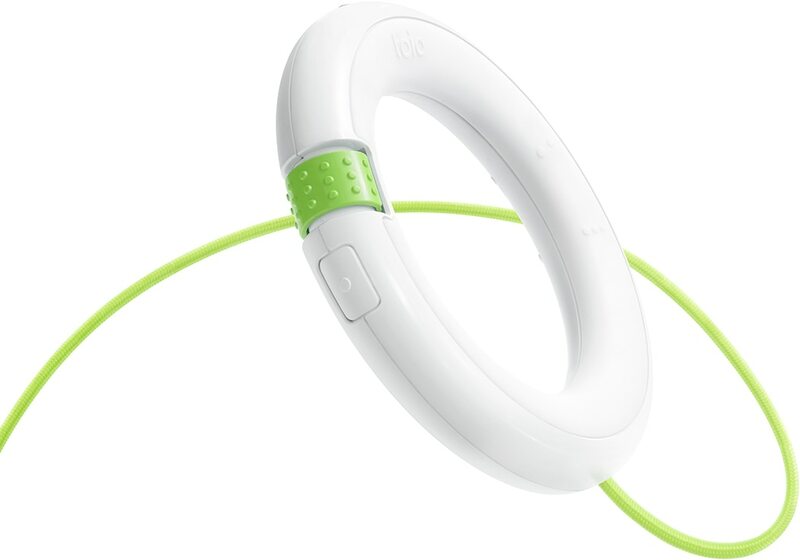 To name the product, the project team fused the element of a "toy come to life"—an innovative style of play—and the circular "O"" shape of the controller's distinctive ring motif to create a fitting name that reflected the product's identity: toio. The system's visual design informs the logo, too, which strikes a simple, consistent look. The final piece was the color scheme. 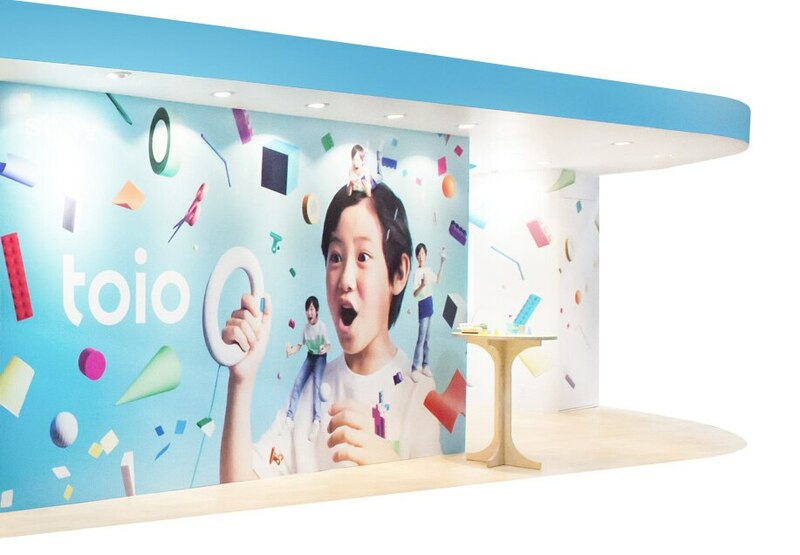 Seeing as how the joys of toio come from the imaginative powers of children, the team chose a sky-blue hue for the toio brand color to evoke the wide-open palette of creativity, a cloudless, boundless blue sky for children to bring their ideas to life under. The overarching concept of the "real" over the "virtual" played into the logo animation, as well. Instead of using digital sounds for the melody, the team decided to base the music around xylophone tones and other percussion motifs to fit with the real-life, organic worldview of the toio play experience. The melody, meanwhile, is a cute, catchy little musical phrase—something that children can hum along to. When I was designing the sounds for the logo animation, I kept dipping back into to my childhood memories of playing with my blocks and wooden toys to get the right vibe. I knew that I had to use realistic sounds, too. All together, I wanted to create a sound profile with the power to make deep, long-lasting connections in people's minds—something that would immediately remind people of their toio and the memories they made with it. The main visual, showing things like scissors, glue, and blocks suspended around a young user with the toio ring in hand, is all about the "eureka" moment—that feeling when you piece things together into a real, fulfilling creation. To complement that image of homespun creativity, the project team decided to make the toio experience space less showy and more reminiscent of a normal child's room. Placing handmade crafts on elliptical tables made of warm, welcoming wood and lining the shelf with toys, the designers assembled a room-like ambience that both emphasized the reality of the toio concept and accentuated the system's ability to spark children's imaginations. The oval shape of the event space itself chimes with the same basic overtones, highlighting the idea that the toio experience keeps on going in an endless succession of play and inspiration—a worldview that clearly had the children at the event spellbound. 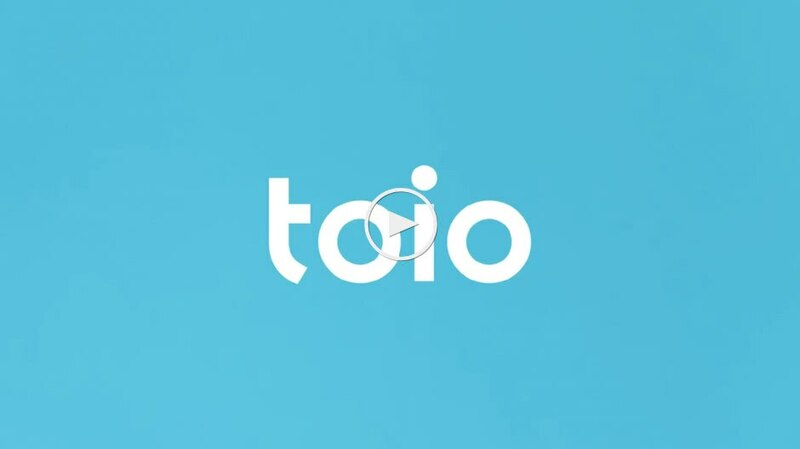 The packaging design features the toio logo against an all-white exterior, another reflection of the infinite canvas that toio provides users. With the minimalist look adding to the anticipation of what might be inside, the first thing the user encounters after cracking open the package is a sky-blue backdrop and a hearty "Hi!" from Mr. toio—the brand character. Aiming to avoid the all-too-common pitfalls of bundling products with stiff, dry instruction manuals, the designers decided to assign the introductory tasks to Mr. toio, who guides the user through the tutorial with ease and pulls children in with an amicable charm. The toio project team balances an innocent, childlike vision with a commitment to professionalism, a combination that lets us offer children some amazing experiences. 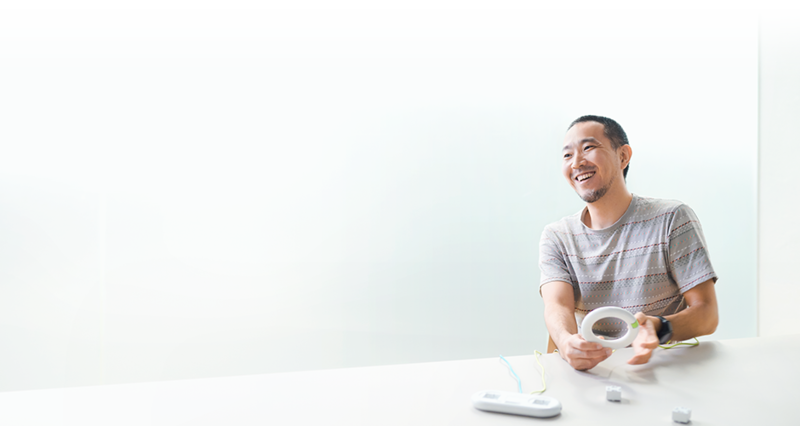 In working with the team to bring toio to life, I always kept one thing in mind: how our designs could bring smiles to children's faces. 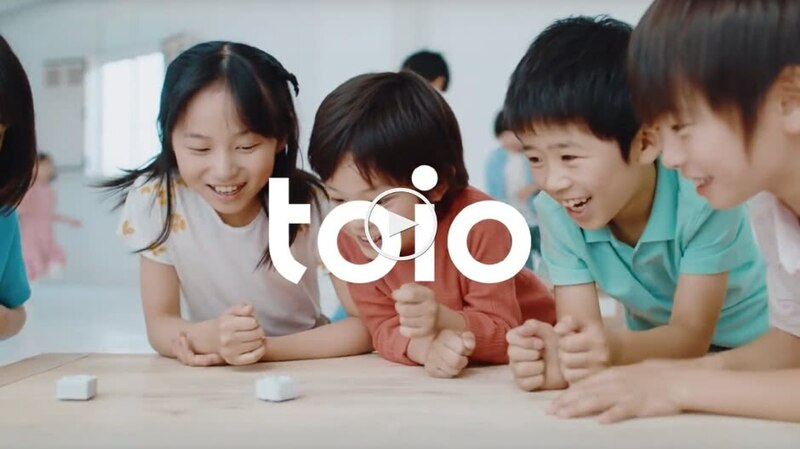 When you look at the design as a whole, I really think you can see our collective belief in toio's potential—a pathway to the future of play—and our love for the children at the center of it all. The toio toy platform turns playing with toys into an outlet for rich, exciting imagination. What does that mean? Giving the next generation of children a real-life, unfiltered way to experience the joys of creation firsthand.